Bill Worrel, the 2018 champion of the Championship Formula Racing-Detroit racing series, picked up right where he left off at the end of the 2018 season. After winning the season’s final race in 2018, he won the opening race of 2019, the Australian Grand Prix, beating 10 other drivers to the finish line. Garry Kaluzny and Richard White were the other podium finishers in 2nd and 3rd place, respectively. The race was on the Adelaide track, and the game-store venue this time was Pandemonium Games in Garden City, Michigan. The race date was February 9, 2019. 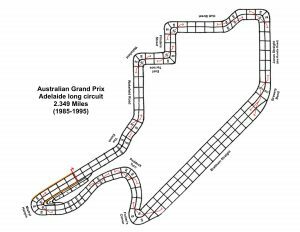 While the Adelaide track diagram was published by the old Avalon Hill game company in the late 1980s, I had designed that same track (for board-game use) around 1985, shortly after the first real Formula 1 race took place at the real Adelaide track. And, since my track design is more accurate than the AH version, we used my track design (not to mention that my track design had already been transferred to a bedsheet way back in 1985!). 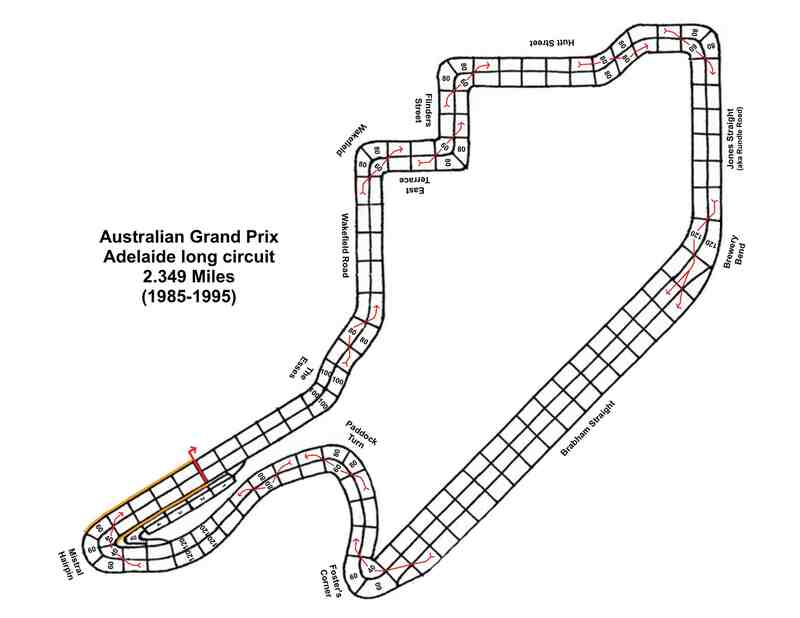 Adelaide track diagram, a design by Garry Kaluzny from 1985. This season, the CFR-Detroit racing series instituted a “team” championship to go along with the individual points championship. The new teams going into the 2019 season: Benetton: #5 Brian Robinson (and #20 Jim Landis, not racing in this race); Camel Lotus: #12 Gary Sturgeon (and #11 Mike Cook, absent from this race); Ferrari: #1 Bill Worrel and #2 Jack Beckman; Marlboro McLaren: #7 Richard White and #8 Garry Kaluzny; McLaren: #9 Mike St. Peter and #10 Aric Parr; Tyrrell: #3 Joel Lauder and #4 Mark Moellering; Williams: #0 Greg Lim (and #6 Jim Robinson, not present). There were two other changes in store for the 2019 CFR-Detroit season. Points would now be awarded to the top eight finishers in each race on a 15-12-10-8-6-4-2-1 basis, instead of the first six finishers getting points on a 10-6-4-3-2-1 basis that was used for the first two seasons of CFR-Detroit racing. And, the Chance Table was changed to what it was in the old Advanced Speed Circuit days, with a 2d6 dice roll of 2 through 7 being success, instead of the CFR 2 through 6 being success. 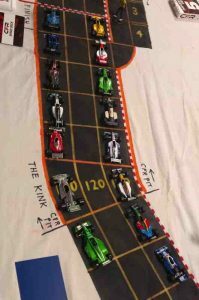 After the teams were settled, it was time to bid for starting positions on the grid, with each driver secretly bidding a number of his wear and/or skill chits, with each wear chit counted as 1.0, and each skill chit counted as 0.5. Naturally, higher bids start in front of lower bids, with any ties resolved by rolling percentage dice (high rolls are better than low rolls). Joel Lauder (3 wear + 8 skill) and Greg Lim (1 wear + 12 skill) each bid 7.0. 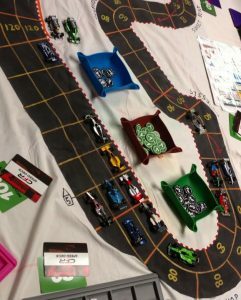 Lauder won the percentage dice roll by “33” to “11” and so Lauder was on the pole position and Lim started next to him in the front row, in 2nd position. Bill Worrel (4 wear + 5 skill) bid 6.5 and started 3rd. Garry Kaluzny (4 wear + 4 skill) started 4th with a bid of 6.0. Richard White (4 wear + 3 skill) started 5th with a bid of 5.5. Starting 6th was Gary Sturgeon (1 wear + 6 skill) with a bid of 4.0. Mark Moellering (2 wear + 2 skill) bid 3.0 to start 7th. McLaren teammates Aric Parr (0 wear + 4 skill) and Mike St. Peter (2 wear + 0 skill) each bid 2.0. Parr started 8th with a percentage dice roll of “84” and so St. Peter started 9th after rolling “43”. Brian Robinson (0 wear + 3 skill) bid 1.5 to start 10th, and Jack Beckman (0 wear + 1 skill) started 11th after only bidding 0.5. 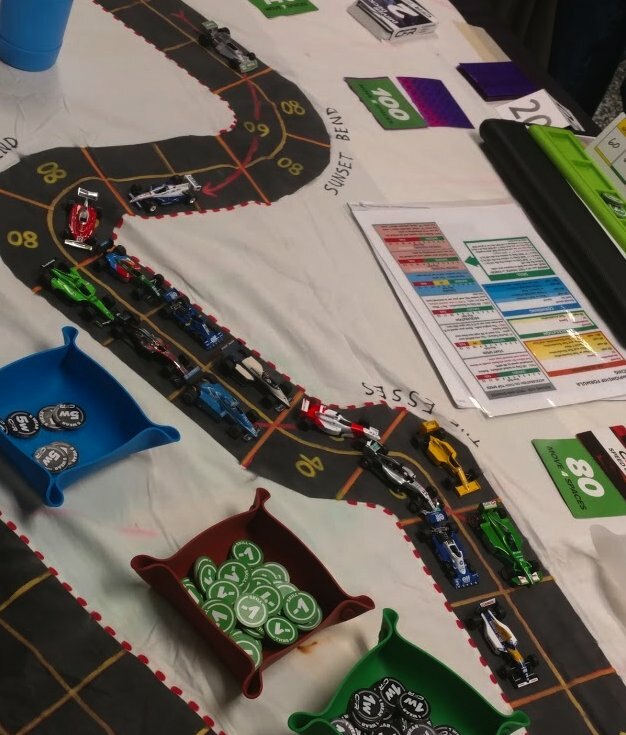 Start = Start Speed (in miles/hour); Accel = Acceleration (in mph); Decel = Deceleration (in mph); Top = Top Speed (in mph); Wear = # of Wear markers (per lap); Skill = # of Skill markers (per lap); Tires = hard or soft tires to begin the race. Starting grid at 2019 Adelaide: Front row: Joel Lauder (blue/white Tyrrell) & Greg Lim (white/blue/yellow Williams); 2nd row: Bill Worrel (red Ferrari) & Garry Kaluzny (white/orange McLaren); 3rd row: Richard White (white/orange McLaren) & Gary Sturgeon (yellow Lotus); 4th row: Mark Moellering (blue Tyrrell) & Aric Parr (orange McLaren); 5th row: Mike St. Peter (orange McLaren) & Brian Robinson (blue/green Benetton); 6th row: Jack Beckman (red Ferrari). Note the temporary straight section used only for the start of the race. The start of the 2019 Austrailan Grand Prix was a rather sane start, what with the track only being 2 lanes wide at the start/finish line. Most cars had a 60 mph start speed, although Aric Parr (starting in 8th place) and Brian Robinson (starting in 10th) had 20 mph start speeds. Most notably, the two cars on the front row, Joel Lauder and Greg Lim, were both shod with hard tires, so most drivers judged it unlikely that the front-row cars would try to boost their start speeds. In the actual start, however, Joel Lauder did boost his speed to 80 mph with a dice roll, with Greg Lim moving his normal 60 mph and slotting in behind Lauder. From the 2nd row, Worrel increased to 80 mph and pulled alongside Lim. Kaluzny wisely moved just 60 mph, and pulled behind Lim, but White, from row 3, boosted his speed to 80 mph and pulled up next to his teammate Kaluzny. Sturgeon went 60 mph to pull up behind Kaluzny, and Moellering, from the inside of the 4th row, went 80 mph to pull alongside Sturgeon. Parr boosted his start speed to 40 mph, and his teammate St. Peter, from the row behind, went his normal 60 mph to pull alongside Parr. Brian Robinson increased his car to 40 mph, and Beckman moved his normal 60 mph to pull alongside B. Robinson. Lauder leads away at the start, followed by Lim, Worrel, Kaluzny, White, Sturgeon, Moellering, Parr, St. Peter, B. Robinson, and Beckman. Worrel then passed Lim for 2nd at The Esses, while White managed to take the inside from his teammate Kaluzny, and Beckman got past Parr. Lauder continued to lead through the three slow corners around Wakefield, East Terrace, and Flinders Street. Racing down Hutt Street, the order was Lauder, Worrel, Kaluzny, White, Moellering, Beckman, Lim (having dropped to 7th after starting 2nd), Sturgeon, St. Peter, Parr, and B. Robinson. As the pack raced down Jones Straight and took the gentle right-hand bend onto the long Brabham Straight, the order was Lauder, Worrel, Kaluzny, White, Moellering, Lim, Sturgeon, Beckman, St. Peter, Parr, and B. Robinson. Lauder leads down Brabham Straight on the 1st lap. The Ferrari of Worrel is racing three-abreast with the McLarens of Kaluzny and White, then is the other 6-wheeled Tyrrell of Moellering, and Sturgeon and Lim, then the plain-orange McLarens of St. Peter and Parr making a sandwich of Beckman’s red Ferrari, and then B. Robinson. At the Foster’s Corner at the end of Brabham Straight, Worrel and Kaluzny caught Lauder, with their three cars playing “chicken” to see who would get through the corner first. Worrel, Lauder, Kaluzny, and White all bunch up at the Foster’s Corner. In the event, Kaluzny managed to take the lead after Foster’s Corner, with Worrel also passing Lauder. Kaluzny and Worrel have passed Lauder after Foster’s Corner; White and Moellering have joined the leading group. The next bunch of cars of Lim, Sturgeon, Parr, Beckman, St. Peter, and B. Robinson now have their turn to play “chicken” at Foster’s Corner! Kaluzny led through the next couple of corners, and then Worrel ducked inside of Kaluzny at the Mistral Hairpin just before the start/finish straightaway. The two Tyrrells of Lauder and Moellering also got past White’s McLaren. Worrel ducks to the inside of Kaluzny at the Mistral Hairpin. As the five leading cars of Kaluzny, Worrel, Lauder, Moellering, and White traversed through the Mistral Hairpin, they all ducked into the pits for new tires. Lauder would switch from hard tires to soft, while the other four exchanged their soft tires for hard tires. (Note: The CFR-Detroit racing series has a rule that all cars must use both hard and soft tires in a race, which means all cars must make at least one pit stop during a race.) Shortly after, the cars of St. Peter and Sturgeon also headed into the pits for new tires (both exchanging soft for hard tires). Most cars pitted at the end of the 1st lap, with Kaluzny, Worrel, Lauder, Moellering, St. Peter, White, and Sturgeon in the pits. Eschewing pit stops are Lim, B. Robinson, Parr, and Beckman. The official order at the end of the 1st lap: Kaluzny (+3); Lim (0); B. Robinson (+7); Parr (+4); Beckman (+6); Worrel (-3); Lauder (-6); Moellering (0); White (-4); St. Peter (-1); and Sturgeon (-5). The numbers in parentheses indicate how many places a driver either gained (+) or lost (-) from their starting position. Kaluzny led the lap by virtue of pitting in the space directly at the start/finish line. After the pit stops were resolved, the running order on the track was: Lim; B. Robinson; Parr; Beckman; Kaluzny; Worrel; Lauder; Moellering; White; St. Peter; and Sturgeon. The 1st round of pit stops are over, and Lim and B. Robinson lead the field through The Esses. 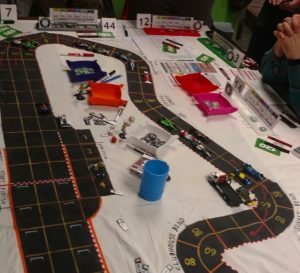 Lim continued to lead through the three slow corners, and managed to stretch out a lead of two spaces over B. Robinson as Lim made the right-hand turn onto Jones Straight. By the time Lim had made the turn onto the long Brabham Straight, he led by four spaces over B. Robinson and Parr. Lim leads down Brabham Straight over B. Robinson and Parr, then came Kaluzny, Lauder, Worrel, Beckman, Moellering, White, St. Peter, and Sturgeon. Lim led into and through Foster’s Corner, but B. Robinson and Parr had closed the gap, and Kaluzny and Lauder were right on the tailpipes of B. Robinson and Parr. Through Paddock Turn, Lim held his lead, with Parr now in 2nd, and Kaluzny managing to squeeze to the inside of B. Robinson to take 3rd place. As he entered the Mistral Hairpin turn, Lim pulled off the track to make his mandatory pit stop. Lim pits at the end of Lap 2. The other cars on the track are running in the order: Kaluzny; Parr; B. Robinson; Lauder; Worrel; Beckman; Moellering; White; St. Peter; and Sturgeon. Shortly after Lim pulled into the pits, he was joined by the cars of Lauder (pitting for the 2nd time), Parr, B. Robinson, and Beckman. The remaining cars, having already pitted once earlier in the race, stayed on the track. Lauder, Parr, B. Robinson, and Beckman join Lim in the pits. Kaluzny is the new leader on the track, followed closely through the Mistral Hairpin by Worrel, Moellering, and White. St. Peter and Sturgeon trail behind. The official order at the end of the 2nd lap: Kaluzny (+3); Worrel (+1); Moellering (+4); White (+1); Lim (-3); St. Peter (+3); Sturgeon (-1); Lauder (-7); Parr (-1); B. Robinson (0); and Beckman (0). After the pit stops shook out, the order on the track was Worrel, Kaluzny (both vying fiercely for the lead), Moellering, White, Lim, St. Peter, Sturgeon, Lauder, Parr, B. Robinson, and Beckman. Early in the 3rd lap, Kaluzny figured he had no chance to hang onto the lead, as Worrel had several more wear chits remaining than Kaluzny, but Kaluzny resolved to try to make it tough for Worrel to get past. It should be noted that during the 2nd lap, Kaluzny had been racing with the cars that would need to make a 2nd pit stop, with the idea being that if he could have got by them he would have made a 2nd stop. He thus used more wear than Worrel, who was driving more conservatively. But when it became evident to Kaluzny that he would not be able to get by the soon-to-pit cars, he belatedly backed off a bit to attempt to save some wear for the final lap. Kaluzny then did take the inside and the lead from Worrel at the Wakefield corner. Kaluzny leads down Hutt Street from Worrel. The rest of the pack is bunched tight in the order: Moellering; White; Lauder; Lim; St. Peter; Beckman; Parr; Sturgeon; and B. Robinson. Down Hutt Street, White passed Moellering for 3rd place, and Parr passed his teammate St. Peter (and Beckman) for 7th place. Kaluzny continued leading Worrel down the Jones Straight and onto the Brabham Straight, then Worrel pulled alongside Kaluzny half-way down the Brabham Straight, with Worrel trying to pass on the inside just before the Foster’s Corner. Worrel tries to pass Kaluzny on the inside at Foster’s Corner. The other cars are running in the order White, Lauder, Moellering, Parr, Lim, Beckman, St. Peter, B. Robinson, and Sturgeon. But not to be denied, Kaluzny held the lead out of Foster’s Corner. But then Kaluzny had to pull up short at the final Mistral Corner (moving at only 80 mph) due to lack of wear, while Worrel passed Kaluzny at that corner, traveling 120 mph and using a wear and successfully making a -3 chance dice roll around the outside lane. Worrel takes the lead at Mistral Corner from Kaluzny. White is 3rd, then Lauder, Parr, Moellering, and Lim are battling for 4th, followed by Beckman, B. Robinson, St. Peter, and Sturgeon in a fight for 8th (the last points-paying position). Worrel then continued moving at 120 mph in his next move, thus reaching the start/finish line and winning the race. Kaluzny could only move at 80 mph, thus being relegated to 2nd place. Worrel takes the checked flag to win at Adelaide, making it two consecutive race wins (going back to the final race of 2018). 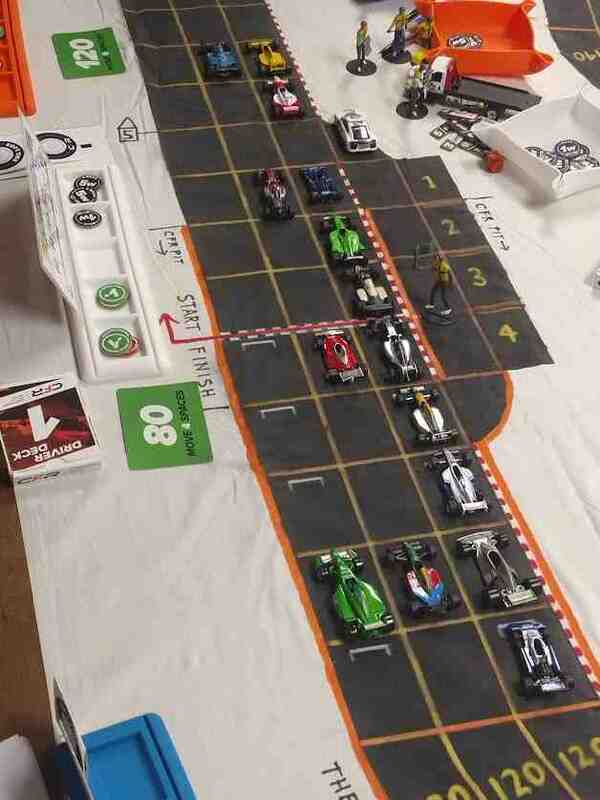 The official finishing order at the 2019 Australian Grand Prix: 1st-Bill Worrel (+2); 2nd-Garry Kaluzny (+2); 3rd-Richard White (+2); 4th-Aric Parr (+4); 5th-Greg Lim (-3); 6th-Joel Lauder (-5); 7th-Mark Moellering (0); 8th-Brian Robinson (+2); 9th-Jack Beckman (+2); 10th-Gary Sturgeon (-4); 11th-Mike St. Peter (-2). 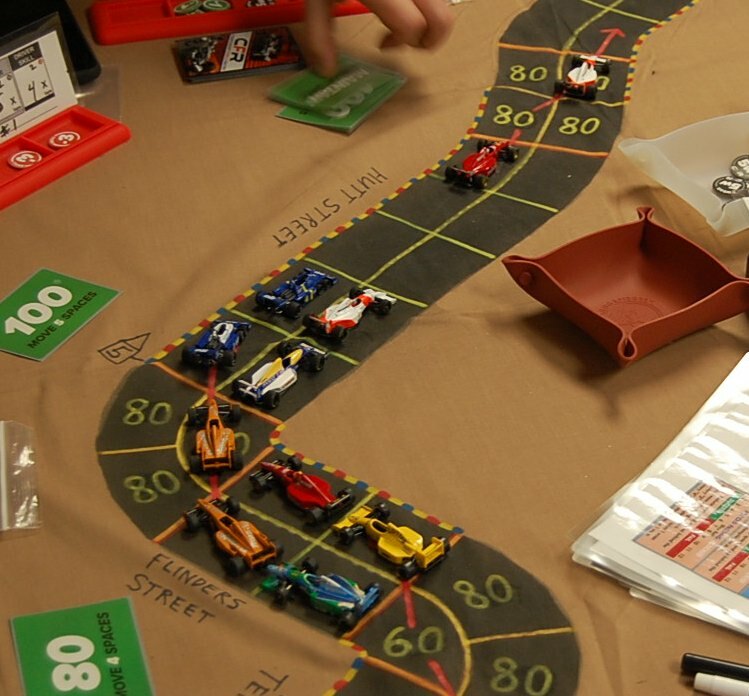 Several cars made chance rolls in the Mistral Hairpin corner, using their -3 skill modifier chits. All of the cars made their rolls except for St. Peter, who spun. It didn’t affect St. Peter’s placing, though, as he was running last when he spun. 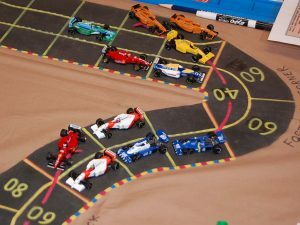 Points awarded at the 2019 Australian Grand Prix: Worrel 15; Kaluzny 12; White 10; Parr 8; Lim 6; Lauder 4; Moellering 2; and B. Robinson 1. Team points awarded at the 2019 Australian Grand Prix: Marlboro McLaren 22; Ferrari 15; McLaren 8; Williams 6; Tyrrell 6; Benetton 1. The Marlboro McLaren team was satisfied with the outcome of the race, finishing in 2nd and 3rd place, and taking the lead in the team championship standings. Aric Parr had a nice drive, finishing 4th after starting 8th. Drivers can only count their 7 best finishes out of the 10 races. Teams can only count their 2 best finishing cars from each race. The next race of the 2019 CFR-Detroit racing series was at the Guild of Blades game store in Clawson, Michigan, on Saturday, March 16, 2019. 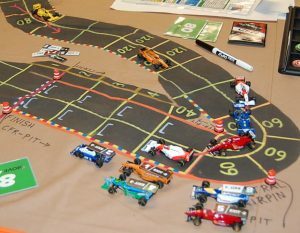 As always, keep up to date with the CFR-Detroit racing series at the home page at http://michigumbo.com/cfr/. 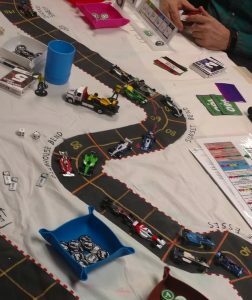 The eighth and final race of the 2018 CFR-Detroit season was held at Pandemonium Games in Garden City, Michigan, on Friday, December 14, 2018. Fifteen drivers contested the race, with five of those drivers having a chance to win the points championship. When all was said and done, Bill Worrel finally drove to his first race win in CFR, and that earned him the championship over Mike Cook, Garry Kaluzny, Richard White, and Jack Beckman. Finishing 2nd at Kyalami was Richard White, and Gary Sturgeon finished on the podium in 3rd place after passing Kaluzny just before the finish line. 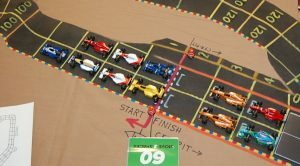 The race was held on the Kyalami track, from an old Avalon Hill design from Speed Circuit. 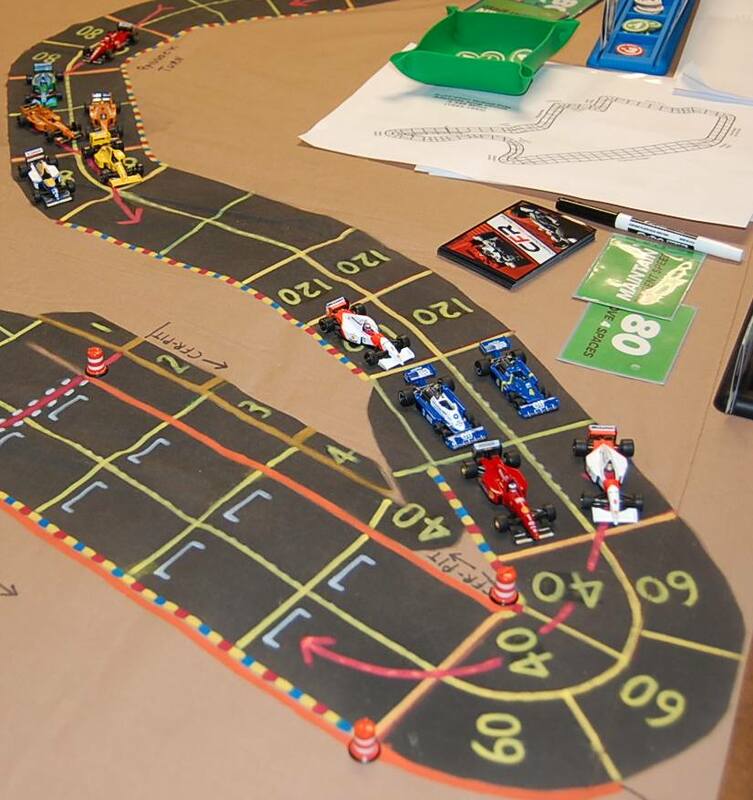 This was the first time this track was used in the CFR-Detroit racing series, although it had been used in the old Advanced Speed Circuit races in the Detroit area back in the 1980s/1990s. Of course, we raced on a large-scale track that had been painted on a bedsheet so we could use our 1:64 scale cars. 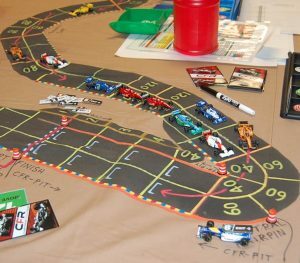 Kyalami race track of the South African Grand Prix. 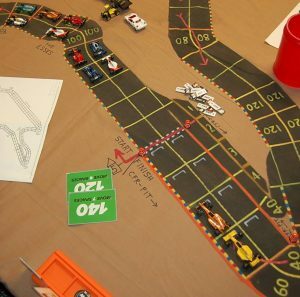 This was from the old Speed Circuit game and was available as an extra item from Avalon Hill. After the drivers set up their car’s specs, the drivers secretly bid for starting positions. Each wear chit counted as 1.0, and each skill chit counted as 0.5. Higher bids started in front of lower bids. Ties were resolved by rolling percentage dice, high rolls favored over low rolls. The four main contenders for the title, Cook, Worrel, Kaluzny, and White, all wanted to start near the front of the large pack of 15 cars. A “wild card” in this race was Louye Padol. Padol had raced in some old Advanced Speed Circuit races in the Detroit area near the end of that series in the early 1990s. Padol further stated that since he had never won a race in that old ASC series that he wanted to win a CFR race. Of course, he knew his work was cut out for him, what with the hungry drivers who really wanted to win the championship. There were some high bids for pole position. Mike Cook snatched the pole with a bid of 9.5 (6 wear + 7 skill). It was Cook’s 8th pole in the 15 races he has participated in, the most of any driver. (Jim Robinson and Bill Worrel each have 2 CFR-Detroit career pole positions.) Louye Padol also started in the front row, in 2nd place, with a bid of 9.0 (8 wear + 2 skill). Garry Kaluzny started in 3rd with a bid of 8.5 (6 wear + 5 skill). Bill Worrel started 4th with his bid of 7.0 (5 wear + 4 skill). Greg Lim (3 wear + 6 skill) and Gary Sturgeon (3 wear + 6 skill) each bid 6.0. 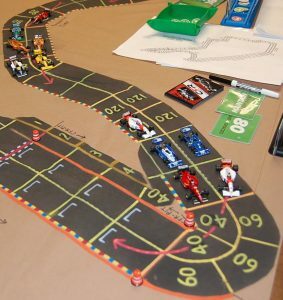 Lim started 5th after his percentile dice roll of “73” to Sturgeon’s dice roll of “06,” thus relegating Sturgeon to 6th place on the grid. Jim Robinson was the 11th place starter with a bid of 2.5 (0 wear + 5 skill). Aric Parr (1 wear + 2 skill) and Jim Landis (1 wear + 2 skill) each bid 2.0. Parr won the dice-off by “45” to “26” and so Parr started 12th, and Landis started 13th on the grid. Joel Lauder bid only 1.0 (0 wear + 2 skill) to start 14th, and P.J. Norton (0 wear + 0 skill) bid nothing and was content to start 15th. At the start, pole-sitter Cook surprised the field by using his -3 skill chit and rolling dice to boost his car’s start speed to 120 mph, giving up the opportunity to use a wear (since he was on soft tires) to get the automatic 20 mph increase to his start speed. Of course, the fact Cook had bid 6 of his available 15 wear to get the pole position might have influenced his choice, since he only started the race with 9 wear. Padol and Kaluzny, both on soft tires, each used a wear to start at 120 mph. Worrel, who was starting the race with 10 wear after bidding 5 wear for qualifying, rolled dice (using two -1 skill chits) to start at 80 mph. Sturgeon was content to just start at his car’s 100 mph start speed; that allowed him to pull alongside Worrel’s blue Tyrrell. Lim used a wear to get to 80 mph; he slotted himself right behind Worrel. White, starting on the inside of the 4th row, also rolled a -2 modified start speed roll, making the roll and thus starting at 80 mph and pulling right behind Lim. St. Peter, starting on hard tires, was content to just start at 60 mph. That allowed Beckman to pull alongside St. Peter after Beckman used a wear to start at 80 mph. J. Robinson used a wear to start at 80 mph, thus leap-frogging B. Robinson who had used a wear to increase his start speed to 40 mph. Parr, starting in 12th, decided to make an unmodified start speed dice roll. Parr rolled an ‘8’ and thus started at only 40 mph, 20 mph below his car’s normal 60 mph start speed. Landis and Lauder started at their normal 60 mph start speed, and they both pulled even with Parr. Norton, making his first official start in the CFR-Detroit races, was content to start at his normal 60 mph speed. On the 2nd move of the game, the leading trio of Cook, Padol, and Kaluzny all increased their speed to 140 mph through the Crowthorne Corner. Worrel spent a -1 skill marker and successfully rolled dice to increase his acceleration. J. Robinson rolled a -2 acceleration roll (and made it). Most of the following cars maintained their order, although Beckman got by St. Peter, and J. Robinson pulled to the inside of St. Peter. Landis got by Parr, and Lauder pulled alongside B. Robinson. As the leaders approached the Jukskei Sweep, Worrel and Sturgeon had caught up to the leading trio. Lauder moved to the inside of White. Going into Clubhouse Bend, Kaluzny passed Padol for 2nd, and the pack was all bunched up again. St. Peter spent two wears and two -1 skill markers (making a chance roll) going through The Esses at 120 mph. Parr tried to force a pass by Landis through Clubhouse Bend, but was balked. Parr then had to scrub off 40 mph to reduce his speed to 60 mph. Going through Leeukop Bend, Cook was able to get clear of the pack, opening a 3-space lead over Kaluzny. Cook was one space shy of The Kink, though, and so he was unable to enter the pits before his following competitors. Then on the next move of the race, Cook did pull into the pits just after crossing the start/finish line. It was the 17th lap Cook has led in his CFR-Detroit driving career, far and away the most of any driver. (Cook has led 38% of the laps he has raced.) Also pitting were Kaluzny, Worrel, Sturgeon, White, and Padol. Lim accelerated to 160 mph out of Leeukop, but then had to roll a -2 deceleration roll to reduce his speed to 140 mph as he didn’t have any wear remaining and so would not have been able to enter The Kink at 160 mph. That left Lim one space shy of getting into the pits on that move. During the immediately succeeding move, the cars of Lim, Beckman, and B. Robinson joined the other cars in the pits; they were eventually joined in the pits by Parr. B. Robinson made a -2 chance roll going through The Kink so he could get into the pits at a higher speed. Not pitting were Lauder, J. Robinson, St. Peter, Norton, and Landis. Lauder was then the leader on the track due to his staying out of the pits. The official order at the end of the 1st lap: Cook (0); Lim (+3); Lauder (+11); J. Robinson (+7); St. Peter (+3); Norton (+9); Worrel (-3); Kaluzny (-5); Sturgeon (-3); White (-3); Padol (-9); Landis (+1); Beckman (-3); B. Robinson (-5); and Parr (-3). The numbers in parentheses indicate how many places a driver either gained (+) or lost (-) from their starting position. After the pit stops were resolved, the running order on the track was Lauder, J. Robinson, St. Peter, Norton, Cook, Worrel, Kaluzny, Sturgeon, White, Padol, Landis, Lim, Beckman, B. Robinson, and Parr. 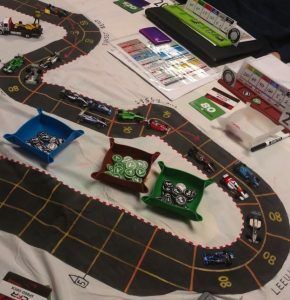 Coming out of the pits, Worrel made a -1 modified dice roll to boost his top speed to 180 mph. Kaluzny also used a -1 modifier to increase his top speed to 160 mph. 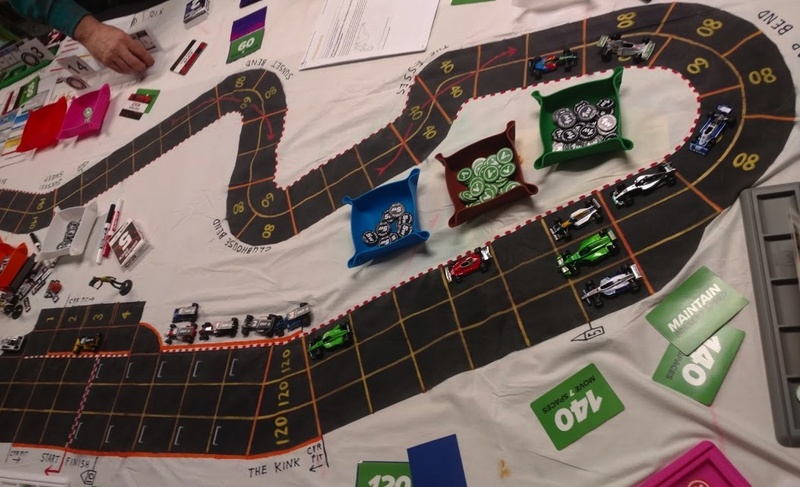 Since the top four contenders basically needed to win the race to also win the championship, they knew going in to this race that they would need to roll some dice! Going into Sunset Bend, Cook made a -1 deceleration roll, and St. Peter used 2 wear and made a -2 chance roll. Then going through Clubhouse Bend, J. Robinson took the lead from Lauder. White then made a forced pass of Worrel coming out of Clubhouse Bend. Jim Robinson managed to gain a 2-space lead over Norton and Lauder coming out of Leeukop, but J. Robinson had to make a -3 chance roll to gain that advantage. Cook had to make a -1 deceleration roll going into Leeukop (dropping to 80 mph from 100 mph), as the road ahead was blocked by Norton’s Tyrrell. 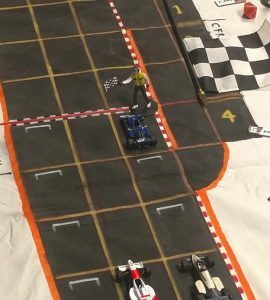 In the process, Cook used his last skill modifier, leaving him with no more skill markers, and there was still a little more than a lap left to race. Now the dice started really flying. Jim Robinson needed to pit, and he wanted to pit on his current move, so he rolled a -2 chance at The Kink, but he spun. He had to roll as he was out of wear. Then Lauder tried to get into The Kink at 160 mph, so he used a wear and also rolled a -2 chance. Lauder also spun. Although spun, both J. Robinson and Lauder’s cars were placed into the pits, as The Kink corner was the first space where cars could pit. Norton made a -2 acceleration roll coming out of Leeukop so he could go 140 mph. That left him once space short of The Kink, meaning he couldn’t get into the pits on this move. During the next move, Norton and St. Peter made it through The Kink, then they both pulled into the pits. Cook, Padol, Kaluzny, and Worrel all made it through The Kink, and Sturgeon and White were in The Kink. That meant all six of those cars could accelerate down the long straight. Cook made an unmodified top speed roll to move at 160 mph. Worrel made an unmodified top speed roll to move at 180 mph. Kaluzny wanted to move at 160 mph, and had to roll for his top speed. In spite of using a -1 skill modifier, Kaluzny failed the roll. He moved this turn at 140 mph, and his future top speed was now only 120 mph. So he knew his shot at the championship was doomed. Landis pulled his car into the pits, as he was the last of the cars that had not yet pitted. P.J. Norton (+14) was the official leader of the 2nd lap, although he was in the pits when he achieved that honor. The rest of the official order for the 2nd lap: Cook (-1); Padol (-1); Worrel (0); Kaluzny (-2); White (+1); Sturgeon (-1); Lim (-3); B. Robinson (0); Beckman (0); Parr (+1); St. Peter (-4); Lauder (+1); J. Robinson (-3); and Landis (-2). Worrel made a daring move to take the lead going into Crowthorne Corner at the end of the long straight. Since he was on the outside of the track, and would have moved after other cars that plotted the same speed, Worrel plotted 180 mph, made his top speed dice roll, but then slowed to 160 mph before actually entering the corner. That let Worrel move before Cook and Padol. Cook did move alongside Worrel in Crowthorne, with Padol right behind them in 3rd. Kaluzny and White were side-by-side behind Padol, and Sturgeon was behind White. Worrel and Cook were side-by-side racing through Barbeque Bend and the Jukskei Sweep. Kaluzny, with his damaged top speed, moved to the outside in Barbeque Bend, letting White pass on the inside. Kaluzny did not want to hold up a competitor who had a chance for the championship. Then came the stunning event of the race. Cook made an unmodified top speed roll to move at 160 mph (so he could move before Worrel) headed into Sunset Bend, and then Cook made an unmodified deceleration roll to get down to 140 mph for the corner. Cook then used 2 wear and rolled an unmodified chance (Cook was on hard tires and so couldn’t use 3 wear, and he was out of skill markers). Unfortunately for Cook, he crashed and was suddenly out of the race, just when he was going for the lead! (Note that if Cook had made the roll successfully, it would have been a piece of “brilliant driving” and might have won the game for him.) Worrel’s car pulled up just short of Sunset, and he took the inside lane, eschewing the cornering arrow that was in the outside lane. Padol then pulled alongside Worrel and took the arrow. White pulled ahead of Kaluzny, and Sturgeon pulled alongside Kaluzny. Now Worrel and Padol had a spirited battle on the track. Worrel spent 3 wear through Sunset and Clubhouse, leaving him with only 3 wear remaining for the rest of the race (and with three more corners to go). Worrel then pulled ahead of Padol at The Esses, as Worrel used a wear and made an unmodified chance roll. (It goes without saying that White, Padol, and Kaluzny were hoping for a spin or crash!) As Padol had taken the line behind Worrel, White had to go off-line at The Esses, using 2 wear and making a -2 chance roll so he could be at 100 mph. Worrel then pretty much wrapped up the race victory and the championship at Leeukop, as he was the only car that made it to the end of the corner where he would be able to accelerate out of that corner in the next move. From that point on, the race to the finish line was an anti-climax, as Worrel crossed the line 3 spaces ahead of White and Kaluzny to win the race and the 2018 CFR-Detroit championship! Kaluzny had used a slip to pull alongside White, especially as Kaluzny didn’t dare roll for his top speed again. There was still a race on for other positions. Beckman made a -3 chance roll at Leeukop, and Brian Robinson used 2 wear and made a -3 chance roll, also at Leeukop. At some point late in the 3rd lap, Padol failed a top speed or acceleration roll, although it wasn’t recorded when it happened. Failing that roll cost Padol a couple of positions at the finish, at least. Also, Sturgeon was able to pass Kaluzny as they crossed the finish line, thereby earning a podium finish in 3rd for Sturgeon. The official finishing order at the 2018 South African Grand Prix: 1st-Bill Worrel (+3); 2nd-Richard White (+5); 3rd-Gary Sturgeon (+3); 4th-Garry Kaluzny (-1); 5th-Louye Padol (-3); 6th-Jack Beckman (+4); 7th-Greg Lim (-2); 8th-P.J. Norton (+7); 9th-Brian Robinson (0); 10th-Mike St. Peter (-2); 11th-Joel Lauder (+3); 12th-Jim Robinson (-1); 13th-Aric Parr (-1); 14th-Jim Landis (-1). Classified in 15th with a DNF was Mike Cook (-14). Louye Padol had a nice drive for his first race using the CFR rules. He was in contention, but he seemed to not want to interfere with the four-way battle for the lead amongst the main contenders for the title. And P.J. Norton, although he had previously raced in a few demo races, performed well in his first official CFR race, moving up 7 places from his starting position to finish in 8th place. 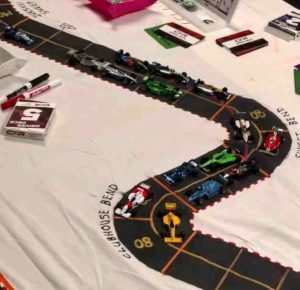 Points awarded at the 2018 South African Grand Prix: Worrel 10; White 6; Sturgeon 4; Kaluzny 3; Padol 2; Beckman 1. After the race, Bill Worrel was awarded the 2018 CFR-Detroit Individual Points Championship trophy from outgoing race steward Garry Kaluzny. 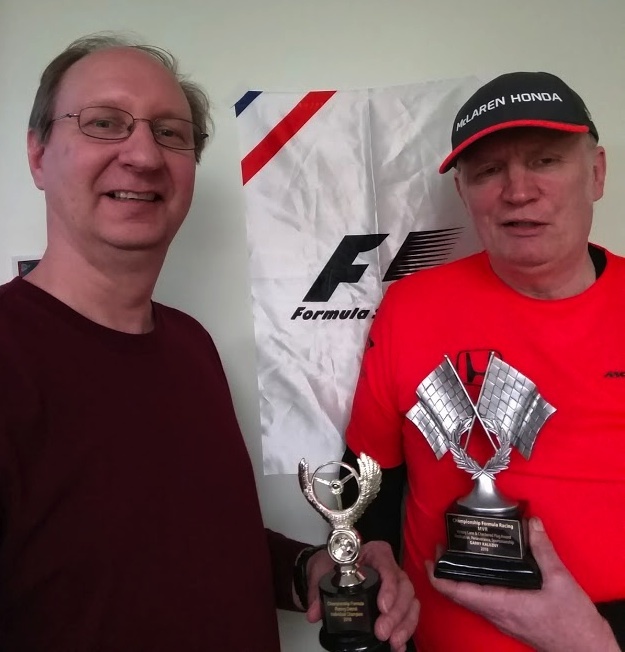 Kaluzny was then surprised when the rest of the drivers gave Kaluzny a trophy for the appreciation the drivers had for his organizing and running the race series for 2017 and 2018. 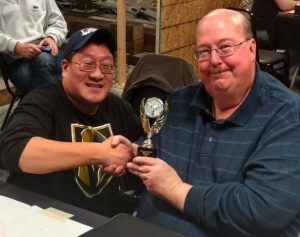 Bill Worrel with his 2018 CFR-Detroit championship trophy (left), and Garry Kaluzny with his appreciation trophy (right). Thus, Jim Landis was voted the Most Sportsmanlike driver of 2018 and was awarded the Tom Kane Memorial Award trophy. In the 2018 CFR-Detroit racing season, a total of 20 different drivers took part in the eight races. The most drivers at any race was 15, at both the Belgian and South African Grand Prix. The fewest drivers in any race was 11, at both the Italian and German Grand Prix. The average number of drivers for the season was 12.8 drivers per race. This was an increase from the average of 10.3 drivers per race in 2017. For the 2019 CFR-Detroit racing season, Jack Beckman will be the race steward. There will also be a “team championship” award added, and already the drivers have mostly formed teams for 2019. As always, keep up to date for the CFR-Detroit schedule at the CFR-Detroit home page at http://michigumbo.com/cfr/. 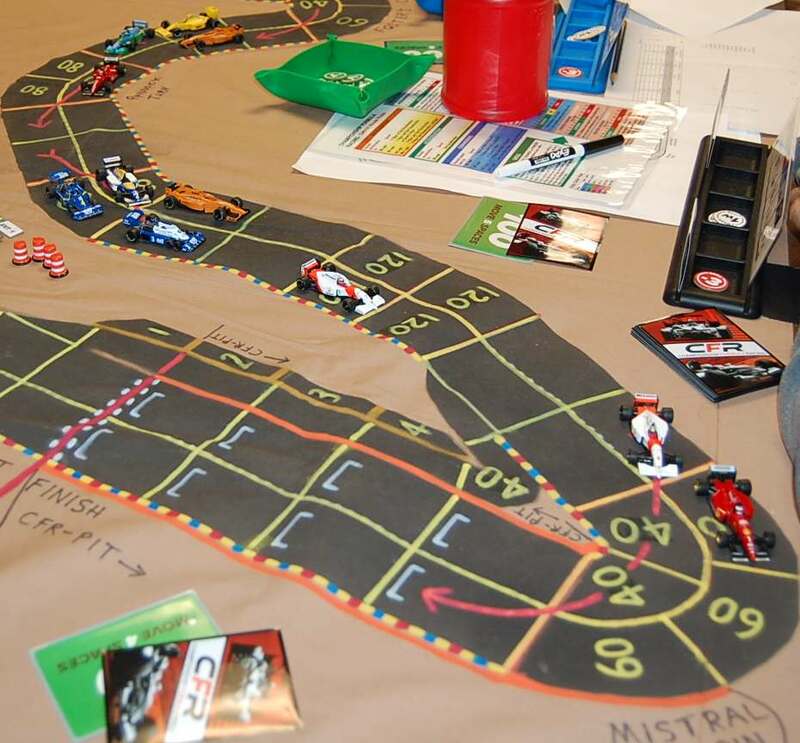 A demo race will take place at Flintcon (in Flint, Michigan) on Saturday, February 9, 2019, using the Indianapolis road course. The actual 2019 CFR-Detroit schedule begins on Friday, February 15, 2019, at Pandemonium Games in Garden City, Michigan. 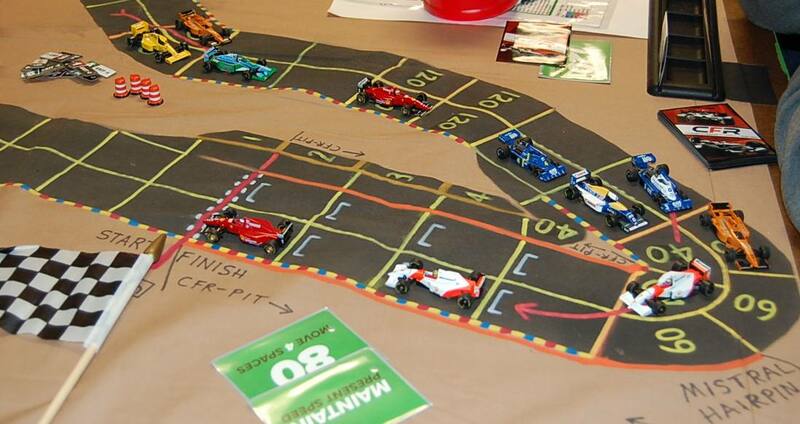 We will race the Australian Grand Prix using the Adelaide track. Qualifying begins at 6:45pm. No experience is necessary; you are welcome to join us!